A Porch can create the perfect secure, warm and quiet entrance to your Kenilworth property. You can have your porch built out of UPVC windows with a UPVC door or composite door, alternatively, you can have the windows and doors made out of aluminium windows and aluminium doors. You can have double or triple glazing in the windows and doors and we can laminate the glass to offer even more security. The windows and doors in the porch can be in a wide choice of shades and colours. 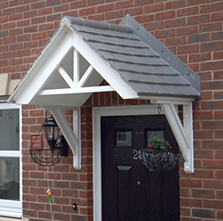 Our Over Door Canopies are designed to be in-keeping with the character of your home in Kenilworth and Warwickshire. We offer a huge choice of styles. Many of our Canopies are made from strong glass reinforced plastic (GRP) making them pretty much maintenance free. Door Canopies are a very cost effective way to protect you, your visitors and your door from some of the worst of the elements and add a stylish feature to your property. Carports are part of the Fox Windows and Doors complete home improvement service. We use Ultraframe roofing systems and can offer your carport in 35m polycarbonate or self cleaning glass depending on your requirements. 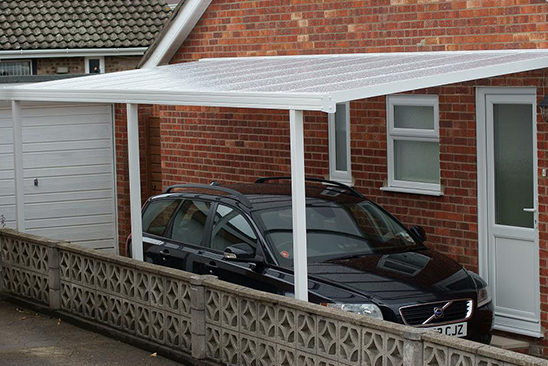 There is a choice of styles for your carport, the lean to is the most popular design. Your carport will be fitted with a guttering and downpipe system so that the water will not be running onto your neighbour’s property. The legs of your carport will be made of either aluminium or steel. You can have your carport in a fine choice of colours which will match the colours of the doors and windows which we offer. So if you would like your carport in Chartwell Green for example maybe to match your front door that is no problem.